BEER LAUNCH: Cassel Brewery introduces Railroad Special Maple Rye — yes, it's made with sap! BEER LAUNCH: Cassel Brewery introduces Railroad Special Maple Rye — yes, it’s made with sap! 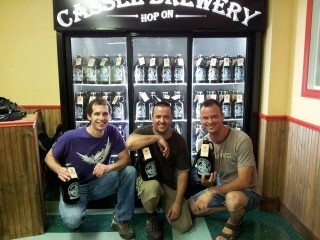 A slow but steady stream of people stopped by Cassel Brewery’s tiny retail space when I was there this past weekend. All had empty growlers in hand, and all were asking Benjamin Bercier, one of the brewery’s three co-owners, if the Railroad Special Maple Rye was ready. It really does. The beer has a very thick, round mouth feel, as if you’re drinking a fermented glass of sap with some malt and hops thrown in for good measure. Bourgeois smiles as I tell him it’s unlike anything I’ve had in recent history. It’s the reaction he’s used to seeing when people have it for the first time. But it’s a recipe he’s been tweaking for years. 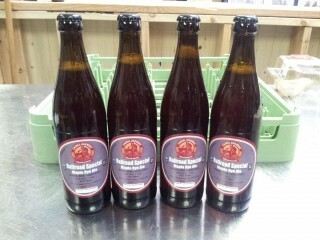 Though Cassel is known for it's growlers, the Railroad Special Maple Rye will be sold in 500-mL bottles. Bercier says they’re completely dependent on the weather when it comes to brewing this beer. At the beginning of March the temperature was good and they were ready to collect the sap, but a cold streak pushed their production back by a couple of weeks. When the sap finally flowed, though, the walked away with 1500L, which created about 750L of beer. This is their first foray into the 500-mL format. Until now Cassel Brewery’s beer has only been available in 1.89-L growlers, but the Maple Rye is their first special seasonal and it weighs in at 8.3% ABV, so they bottled accordingly. And they did it all by hand. “We don’t have the capacity to produce the 500-mL bottles here, so we did it ourselves, one-by-one,” Bercier says. “But we’re talking with Beau’s right now about getting their old bottling line. We want to buy the space next to us to create enough room for the bottling line, and it will allow us to make a new retail space that’s more fun for our customers. It will also put them one step closer to getting their beer in the LCBO. Yes, Cassel Brewery is moving into the LCBO — hopefully by the end of the year, just in time for the Christmas rush. It’s a big move for a small brewery, but Bercier feels they’re ready for it. For now, though, you’ll have to make the drive to Casselman. And you should do it soon as the Maple Rye won’t be around for long. It goes on sale tomorrow, with a bottle going for $7.25. Bercier says they will do a small test run of about 100 bottles at Ottawa restaurants, but you’ll have to follow their Twitter and Facebook pages to find out when and where!